The speaker in the video may have no association with ( Kerry Nicholson González, Pilates Instructor, Columbus, OH ). 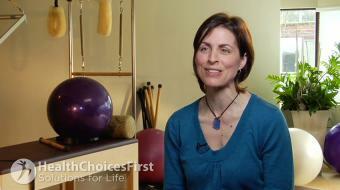 ( Kerry Nicholson González, Pilates Instructor ), may talk about some of the conditions and some of the treatment options shown in the videos on HealthChoicesFirst. Always talk with your health care practitioner about the information you learnt from the videos in regards to treatments and procedures the healthcare practitioner could perform and if they would be appropriate for you. Remember good information is the corner stone to understanding your condition or disease. Please contact ( Kerry Nicholson González, Pilates Instructor, Columbus, OH ) to enquire if this health care provider is accepting new patients. Who Can Benefit from Pilates? A Pilates instructor has achieved a certain level of certification and qualification to teach this fitness system developed in the early 20th century by Joseph Pilates. Pilates improves a person's core strength and stability, and is a popular way for people of all ages to increase flexibility and endurance using mats and equipment. In working with clients an instructor can also educate them on prenatal Pilates, Pilates for arthritis, flexibility, Pilates reformer, Pilates chair and studios. Treatment Options for Knee Pain While Gardening " Agnes a 52-year-old with medial-sided knee pain "
Knee Pain from A Motor Vehicle Accident " James a 38-year-old male suffers a motor vehicle collision "
Psoriatic Arthritis and How is it Treated? Trudy is a 36-year-old female teacher with swelling"
Acute Knee Injuries " Serena is a 17-year-old competitive soccer player "